When I think about checkered patterns, I remember seeing those checkered Vans on the goth kids all throughout middle school and scoffing at them. 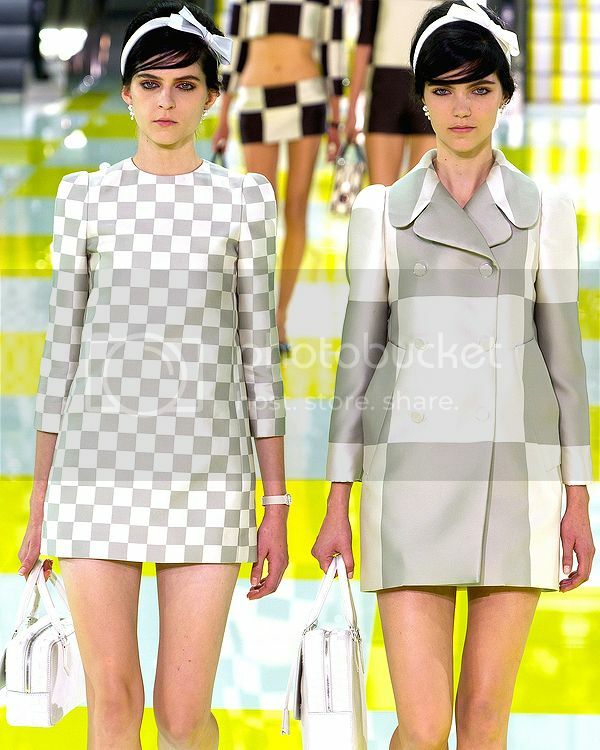 But now I look at checkered patterns and think of the Louis Vuitton Spring 2013 collection, beautiful shift dresses and jackets, all in that bold pattern. Since the Louis Vuitton collection are always way ahead of their time, checkered patterns are showing up in stores and magazines this season as well. You can certainly expect to see checkerboard patterns everywhere this fall. This outfit makes me so excited for Fall. The muted colors, the tights, the booties, I can't wait! I am in love with that Heather Hawkins necklace, so much that I went back and added some Heather Hawkins earrings to match. Another outfit that makes me excited for fall, I adore these colors. And once again I put a PS1 in a Trend Report. I just love that bracelet so much, it's se delicate. And the woven loafers are so preppy and cute. I love loafers in the fall. They give a real polish to any outfit. Oh how I would feel like an important business women wearing this. A fashionable business woman. This skirt is an example of how it's okay to mix nay and black, something that has been a huge debate in the fashion world for quite some time. How awesome is that Miu Miu bag? It's perfect for work. How do you wear the checkered pattern? Check out all of my past Trend Reports here! The first outfit is to die for! Absolutely love this post! The outfits you've put together are great, was so inspired when the Vuitton collection came out and can't wait for checks to hit the high street! I love that first set. Not sure what I will be doing with checker-printed pieces this Fall, but thanks for the ideas.